The Bolsa Chica Ecological Reserve aka the Bolsa Chica Wetlands is one of the top birding sites in the country, and it is right here in Orange County. The Bolsa Chica Ecological Reserve is a type of ecosystem that wasn't valued until recently. People used to drain the water off of wetlands and use it for farming, and housing, and other uses. It was viewed as wasted land. The real value and functions of wetlands were not appreciated. However, wetlands have vital functions that affect all our lives. Read more about wetlands in the links below. The foot bridge over the water off the PCH parking lot. Bolsa Chica was recently upgraded you might say. They paths were raised and graded and covered with gravel, and an new inlet from the ocean was opened. This has only made a great place even better. 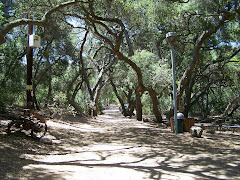 It is handicapped accessible, and fairly level walking. I like starting from the Pacific Coast Highway parking lot the best. There is also a parking lot and interpretive center at 3842 Warner Avenue on the south east corner of PCH and Warner. You have to turn onto Warner and turn right at the first light to enter the parking lot. Please remember that these parking lots are for the Bolsa Chica Ecological Reserve only. No beach parking is allowed. For more details on the rules at Bolsa Chica Ecological Reserve, see my post Rules at Bolsa Chica. To report violations of the rules you may call the Department of Fish and Game at (858) 467-4201. Snowy Egrets hunting for fish. 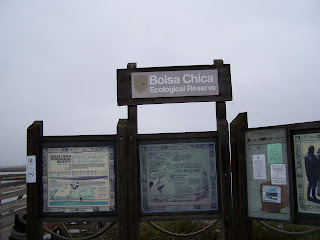 Finding Bolsa Chica Ecological Reserve is not as hard as you might expect. To get to the Pacific Coast Highway parking lot, you go south on Golden West, turn right and head north on PCH. Immediately after passing the light for Bolsa Chica State Beach, you will see two things on the right. A wooden bridge across the water and a small tool shed. Turn into the driveway immediately after the tool shed and park. 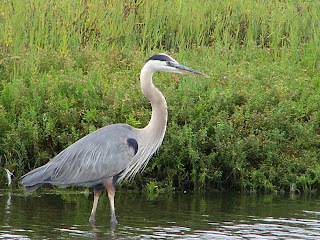 A Great Blue Heron photo taken from the wooden bridge. Birdwatching starts in the parking lot. Standing in the parking lot, look out into the water and reeds to the right as you face the wooden bridge and you may see Snowy Egrets, Great Egret, Great Blue Herons, or even a Black-necked Stilt. Look overhead and you may see a Brown Pelican, Forster's, Elegant, or Least Tern, a Turkey Vulture or an Osprey. 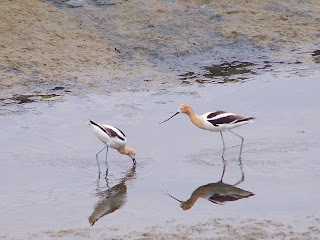 American Avocets in breeding plumage. As you walk across the wooden bridge you will hear pigeons underneath on the wooden supports of the bridge, and perhaps hear terns splashing into the water to catch a fish. If the tide is low, there may be Great Egrets or a Great Blue Heron fishing in the shallows. A Green Heron fishing on the rocks. There may be Willets, Marbled Godwits, or Black-necked Stilts in the marsh grasses, a Northern Harrier flying low over the wetlands, and Pied-billed Grebes swimming in the water. Great Egret walking to a new fishing place. As you leave the bridge and walk along the chain-link fence that protects the nesting area, you might catch a glimpse of a flock of Black Skimmers sitting on the shore. They have very large orange-and-black beaks. You might even see one skim the water for fish. Black Skimmers sitting on the shore. As you pass the fenced area, you will see an observation platform on the right with benches to sit and watch the wildlife. There are often Double-crested Cormorants with their wings held open to dry, Brown Pelicans, gulls and terns of many kinds sitting on the strips of frequently flooded land the extends out in to the water. A mature Brown Pelican with two immatures Brown Pelicans on either side. The restored Bolsa Chica is even more amazing that the original. Photographers with cameras that dwarf my little Easy Share Kodak with its 10x zoom line up on the bridge on any given morning. They snap away recording the wildlife close up and personal. Someday maybe I too will have to work out to carry my camera equipment. Until then, I will continue to carry my little camera and take pictures. 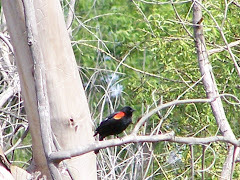 Bolsa Chica Ecological Reserve is one of the best birding spots in Orange County. Don't miss it. 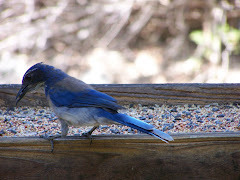 Next time you are out birding, consider visiting this wonderful birding hot spot. Even has a section on books for children about wetlands. They have meeting which are open to the public. You can sign up on this site to be informed of when they meet. They are part of The Coastal Conservancy which is a state of California Agency. A guide to seeing Bolsa Chica from a wheelchair. 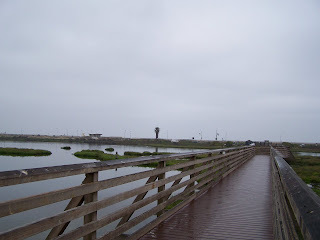 Many areas of Bolsa Chica are wheelchair accessible and easy for the disabled and the elderly. Extensive bird guide listing birds of Bolsa Chica. On this page,. 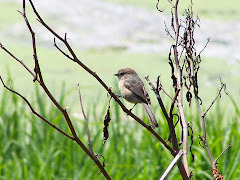 you can download a checklist of birds or a checklist of mammals that live at or visit Bolsa Chica. 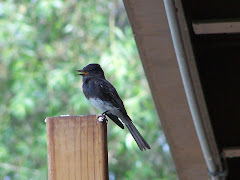 Has a printable checklist of birds. Shows what has been and will be done to restore the wetlands. The Trust supports preservation of the wetlands and mesa areas and its members have put in many hours of work creating trails and planting native plants. The lead free tours the third Sunday of every month. This is the National Marine Fisheries Service section of NOAA site about the Bolsa Chica Restoration. They manage "living marine resources." In addition to the documents on this site, is a page of pictures of birds and people at Bolsa Chica. This agency is one of 8 state and local entities involved in the the steering committee. 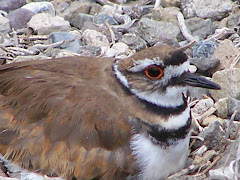 CWIS has a page of information links including a large list of plant, insect, and animals found in California Wetlands. The Environmental Protection Agency Page on the Restoration at Bolsa Chica. Short text and links about the restoration. One of the 8 steering committee members. Lots of links and publications and video archives of their meetings. Lots of links to legal information such as acts and legislation. Documents about Bolsa Chica held by the Bolsa Chica Foundation in their library. To read about or buy this book on Amazon, click the picture below.